Last night I was going through an old Southern Living Annual (2002) and this zucchini cake caught my eye. The only problem was, it was a giant Bundt cake and I just don’t need a full Bundt cake. No problem. I halved the recipe and turned it into Chocolate Zucchini Cake in a Loaf Pan. Below is my version which I modified slightly by adding a few miniature chocolate chips and a dash of vanilla. Results were excellent, but I think the cake would be fine even without the extra chips. And speaking of chocolate, someone in the review section of myrecipes.com said that she used cocoa powder & extra oil in place of the 1 ½ oz melted chocolate. 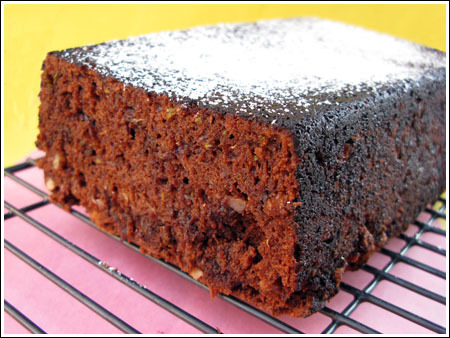 The substitution for a loaf cake would be 4 ½ tablespoons unsweetened cocoa powder and an extra 1 ½ tablespoons oil. So if all you have is cocoa, you can still make the cake. Preheat oven to 350 degrees F. Grease a 9×5 inch metal loaf pan and dust it with cocoa powder. Alternatively, you may just spray it with flour-added cooking spray. Beat eggs with an electric mixer. Gradually add sugar and continue beating until light. Reduce speed of mixer and beat in vanilla, melted chocolate and oil. By hand, stir in the flour mixture. Fold in zucchini, pecans and chocolate chips. Pour batter into pan. Bake at 350° for 70 minutes or until a wooden pick inserted in center comes out clean. Cool in pan 15 minutes. Remove from pan; cool completely on a wire rack. Sprinkle with powdered sugar before serving. Chocolate Zucchini Cake is a weakness of mine and your tempting picture doesn’t help:) I wonder how this cake would work with applesauce instead of oil? Or would it? I don’t know if you have seen this recipe before; it was in Sunset Magazine a few years back. I substituted dried cherries and pecans for the raisins and walnuts. The cookies turned out almost a cross between a muffin top and a cookie. Yummy! I sold homemade cookies at our last garage sale. They were a big hit! If I would have spent more time baking, I probably would have made a lot more cash, since most of our old junk didn’t sell. Everyone has money for cookies! I would love to go to a garage sale (never been to one). Of course I would prefer to be served that cake whenever I go to one! Looks very moist, almost like a mousse, but maybe that’s because of the picture. I agree with Bethany, you should totally do a bake sale! I say sell the cake and stash the recipe somewhere between the seat cushions! If I were the buyer, I’d be happier than if I had found loose change. Mmmm. I’d buy a sofa for that. You should SOOOO have a bake sale on the side of the garage sale! Definitely serve it at the garage sale!! I had my mom make a chocolate zucchini bundt cake several years for my birthday. I was able to justify that it was healthier than a normal cake. I agree with Bethany! Especially if it’s getting to the end, hasn’t sold, and you don’t want to have to drag it back inside! I love zucchini cake, one time though my uncle made zucchini ice cream to go with it-not as good! I bought one of those giant overgrown zucchini at the farmer’s market last week just to make something yummy like this with it. Love that, buy a sofa get a piece of cake!